" Ceann Loch Iú "
As the name would imply,Kin(head of) Loch Ewe, was at the head of Loch Ewe, this was the case until the 17th century when the loch name was changed to Maree in memory of St Mealrubha, he is recorded as bringing Christianity to this area of Scotland, Mealrubhas cell was on Isle Maree, one of the Loch Maree islands. 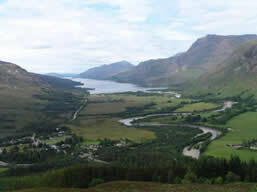 The area is renowned for its geological features, the most famous of these, the "Moine Thrust", runs through Glen Torridon and Kinlochewe.The International Appalachian Trail runs through the village following the route of the Cape Wrath Trail. 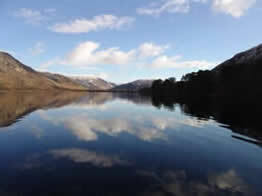 The area around and within Kinlochewe abounds with mammal,insect and birdlife, together with a rich flora. For the naturalist,botanist and photographer it is a general landscape and wildlife haven. Linger awhile to explore and experience what this unique area has to offer. Azure Hawker, Northern Emerald and a wide variety of other rare dragonflies are a speciality of the area. The village of Kinlochewe is bordered by the Beinn Eighe National Nature Reserve the Fisherfield Forest and in the centre of the Wester-Ross National Scenic Area. In March 2016 Wester Ross was designated as a UNESCO Biosphere Reserve, an accolade of excellence and Worldwide recognition, Beinn Eighe is at the heart of this reserve as the main Core Area. 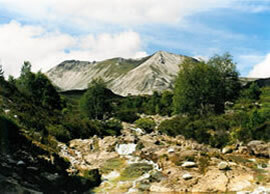 Beinn Eighe National Nature Reserve, Scotland's first and grandest, established 1951. This 5,000-hectare (12,350-acre) mountain fastness of Caledon pinewoods, barren moors, and lochans, has breathtaking views over Loch Maree and Torridon. 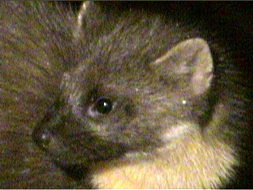 Among the wildlife can be found pine marten and wildcat. Two waymarked nature trails lead from a signposted roadside car park 3 kilometres (2 miles) west of the newly refurbished visitor centre at Aultroy. The Caledonian pinewoods by Loch Maree can be enjoyed on a steep but rewarding nature trail, which starts at the National Nature Reserve Trail car park . Pine martens and red deer can often be spotted along the trail. From the Aultroy visitor centre access is given to excellent short trails suitable for all,the Rhyming Trail is wheelchair friendly,the longer Ridge Trail is also wheelchair friendly for part of the route,the upper section is unsuitable having steep slopes and steps. All routes have descriptive panels giving an insight into the surrounds. kinlochewe is The ideal base for exploring the Torridon Mountains area, isle of skye and the north west highlands of scotland.